It can cost top dollar to attend stand-up comedy shows nowadays, with celebrities charging up to a shocking £100 for an evening of entertainment. Being such an eclectic and artistic city, however, London does offer a huge array of other performances for a mere snippet of arena and stadium prices – and we’ve even found some that are 100% free of charge, as well as being of good quality and at reputable venues. 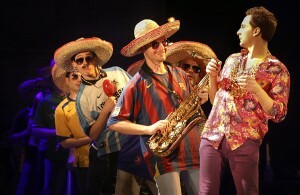 Adam Larter’s fearless crew of risqué and uproarious comedians have become a firm favourite on London’s urban theatre scene. Highly experimental and completely against the mainstream, this troupe creates conceptual comedy that tends to based either in current affairs, or complete fiction. It’s a wholly unusual experience and definitely not for those just looking for gentle laughs – rather, you can expect side splitting laughter with a few totally inappropriate celebrity references, and a healthy tinge of cringe. Audience participation plays a big part, too…so don’t sit at the front if you’re feeling a bit shy! 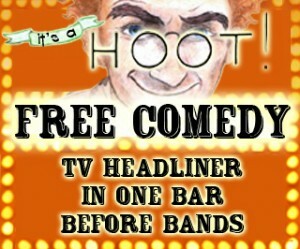 Quirky company ‘It’s a Hoot’ are taking over one of London’s Hootananny bars every Friday night, as a support act to the headlining musicians. It’s a great opportunity to see up and coming comedians offering fresh and original material, and many a famous name has been featured on the programme in the past. The entertainers are put through a rigorous audition process to bag a slot at this popular bar, which makes for a varied yet consistently brilliant line-up. The first show takes place tonight – see the Brixton Hootananny’s website for more details. Stratford’s famous Theatre Royal opens its doors every Monday night for an evening of top quality comedy – without charging you a penny for the privilege. Now established as London’s longest running free comedy night, the programme offers up an eclectic mix of almost every genre of humorous live entertainment. You never quite know what you’ll come up against at this event, but if you’re open minded (and get there early enough to actually get a seat), it makes for a wonderful evening of unpredictable and diverse theatre. If you fancy trying your hand at stand up, make sure you pipe up towards the end of the show – when open mic performers are given the chance at least a few minutes on stage to showcase their talent. The Theatre is currently arranging a whole new programme of events – keep an eye on their website for the upcoming show listings. On the last Tuesday of each month, The Comedy Grotto, King’s Cross, hosts comedy nights in aid of various charities. It’s not a ‘free event’ as such – a donation bucket is passed around, but we’re sure you’ll be more than happy to chuck them a few quid after what’s certain to be a brilliant evening of comedy. The Grotto recruits both amateur and professional performers for their shows, so you may well see some famous faces as well as fresh ones. Joe Wilkinson (best known from 4 out of 10 Cats Does Countdown) was there last time we visited – and every performer who is lucky enough to land a gig here seems to thrive in the atmospheric, stylish and stereotypical-comedy-club environment of this treasured venue. Please Like our Facebook page to keep up to dates with events in London and the UK!